Lions vs. Bears: Calvin Johnson didn’t catch it? We’ve already had a tons of posts and emails about this, but people are steamed about the Calvin Johnson’s catch at the end of the Bears/Lions game being overruled. It sure looked to me like a catch. Here’s a video of the play, so leave your comments below. 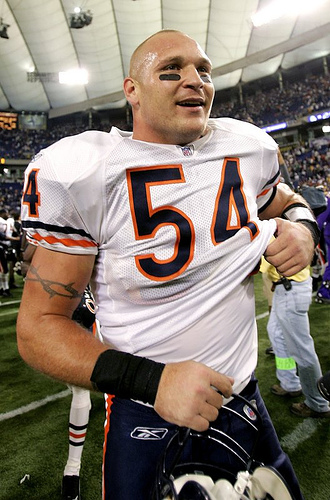 Brian Urlacher, linebacker for the Chicago Bears, has been fined $20K by the league for “abusive conduct toward a game official”. The words came following a bizarre play last week in which the Falcons fumbled the ball, the Bears recovered it, then they fumbled, and the Falcons got the ball back. The result of that was a first down for the Falcons, because the ball had changed possession. It was a confusing play, but it certainly seemed that Al Riveron and his crew took their time and made sure to get it right. I guess Urlacher was just frustrated with the play, because the refs certainly got it right. Other players were recently fined for similar incidents, including Miami’s Joey Porter, Denver’s Dre Bly and the Rams Richie Incognito.